If router bits were hand tools we’d almost certainly handle them quite differently, but when it’s the power company that’s doing most of the work, it’s easy to forget what makes cutting tools cut. When working with hand planes or chisels, we take it for granted that we’ll have to stop fairly often for a quick round of re-sharpening. 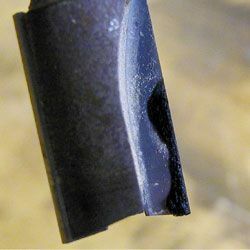 Even though good-quality carbide can be expected to hold an edge perhaps twenty times longer than tool steel, it should be fairly clear that sharpening is going to have to be regular business. 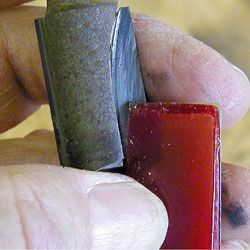 If a good chisel might need sharpening twenty times during the course of a week’s hard work, then a carbide-tipped router bit doing the same work will have to be sharpened at least once a week. I don’t know about you, but that sure isn’t the way I used to treat my router bits. Even on a hard, brittle wood like oak, tearout can be greatly reduced with a sharp bit. Sharpening router bits is surprisingly easy to do. You don’t need a sharpening jig, precision measuring instruments or complex machinery. All you need are a couple of diamond paddles (or diamond needle files for the smallest router bits), a good light source and a comfortable place to sit. You’re only going to work on the flat radial face of each flute, so there’s no fancy fingerwork required. (You don’t want to work on the outside edge of the flute, of course, because that would alter its diameter or profile quite quickly.) It’s fairly important to sharpen uniformly so the router bit will remain balanced and cut smoothly. Rather than working on one flute until it’s sharp, and then doing who knows what to the other flute, you can insure an even job simply by giving one flute five or ten strokes, rotating the router bit and giving the next flute the same number of strokes, then back to the first, and so on. Lay the diamond paddle or needle file on the flat face of the flute, holding it lightly so you can feel it staying flat, and have at it. Your diamond abrasives can be used dry, but they’ll resist clogging better and need cleaning less often if you keep them wet with water or light oil. We usually hold the router bit in one hand and the sharpener in the other, but if it feels better to you, try securing the router bit in your router collet or drill chuck on your workbench. (600 grit) or extra-fine (1200 grit) diamond abrasives; if a router bit needs more aggressive work than these can provide, it probably ought to be sent out for professional grinding. 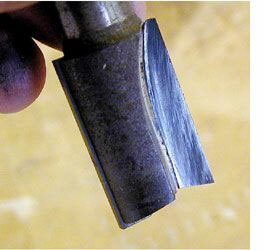 Coarse diamond abrasive wielded by hand will simply fracture brittle carbide edges. How do you know when the router bit is finally sharp? Just feel it and look at it. If under a strong light you see no flecks of light along the edge, and if it feels good and sharp, then it isyou’re done. Regular cleaning is nearly as important as sharpening. Baked-on crud around a cutting edge interferes with chip clearance, reduces relief behind the cutting edge and increases frictional heating just as if the edge were dull. We use our non-caustic Blade and Bit Cleaner instead. Remove ball bearing pilots before cleaning. Brush or spray a liberal coating of cleaner all over the cutting edges, let stand ten or fifteen minutes, then scrub clean with a toothbrush or brass stove brush under a stream of warm water. Dry the router bit thoroughly and go back to work. 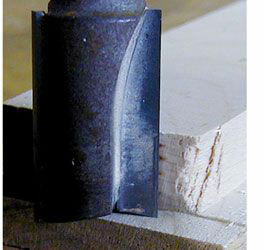 We recommend against oiling router bits to prevent corrosion, since it’s friction that holds them in the router. Just dry them well and you should have no problem with rust. If you’re working in pine or other resinous woods, it might be necessary to clean your router bits every day. It might take a while to get used to that idea, but the payoff will be pretty convincing. Dri-Cote, a spray-on coating available from Highland Woodworking, does an effective job of slowing resin accumulation on router bits and helping them run cooler. The time you spend cleaning, sharpening and using your router bits gently almost surely costs less than replacing a router bit when it dies before its time. It’s certainly worth a fair amount of work to avoid the nuisance of feeling a router bit has gone defective on you, sending it back where you bought it and then waiting for a replacement. And if your work turns out a little better because your router bits are always in like-new condition, call it a bonusyou’ll have earned it. you could help I would appreciate it. thank you!